With Toronto hosting it's second MLS Cup, this was the first in which they were competing. 90 minutes passed, 120 minutes passed, and neither team could score at on the frigid December evening at BMO Field. 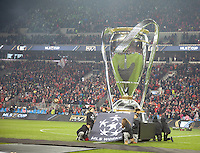 Penalties were taken, and the Seattle Sounders, led by former Toronto keeper Stefan Frei were the ones hoisting the trophy.